Pastor Gunn was born in Marion, Arkansas and at the age of 9 yrs old moved to Fort Worth, Texas with his parents and 8 siblings. He is the 5th child born to Loubertha and William Gunn. Pastor Gunn is married to Valeria Lewis-Gunn and they have two children, Gabrielle Samone Gunn, and Michael Josiah Gunn. Pastor Gunn attended and graduated from Texas Wesleyan University, Ft. Worth, TX with a Bachelor of Science, with an emphasis in Criminal Justice. He attended and graduated from Cambridge College in Boston, Mass. with a Masters in Education. He attended Southwestern Baptist Theological Seminary and graduated with a Masters of Divinity. Currently, he is attending Southern Methodist University (Perkins School of Theology) working on a Doctorate of Ministry. After working in Criminal Justice as a Parole and Probation Officer for 9 years, he changed career paths and went into the field of education. He was employed with the Fort Worth ISD for 5 yrs and is now currently employed with the Dallas ISD as an Educational Diagnostician. 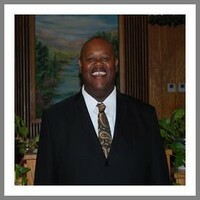 Pastor Gunn accepted his call into the ministry in 1995 under the leadership of Pastor R.L. Sanders, Pastor of Pleasant Mt. Gilead Baptist Church, where he served as an Associate Minister. He later served as Youth Pastor and Associate minister of Morningside Baptist Church under the leadership of Pastor Kenneth Walton. Pastor and Sister Gunn founded Harvest for the Nation Ministries and began serving and ministering in Ft. Worth area nursing homes. Today, he is the Senior Pastor of Clark Street Christian Church (Disciples of Christ) in Greenville, Texas. Helping others is very important to Pastor Gunn and he has volunteered his services with several nonprofit organizations. He has served with the Fort Worth Food Bank, Mission Arlington and Tarrant County Advocacy Program as a mentor for troubled youth. During his free time, Pastor Gunn enjoys reading a good book, participating/viewing sports and spending time with his family.